Happy Yule! Today we have our favorite carols, poems, recipes, and even a little lore for the winter holidays. Have a blessed and happy holiday season! “A Visit from St. Nicholas,” attributed to Clement Clark Moore, but likely written by Henry Livingston, Jr.
“The Oxen,” by Thomas Hardy. Recipes for Tom & Jerrys, Reindeer Food, and Gingerbread cookies. Holiday animal lore can be found here. Nearly every song can be found on CDBaby.com or iTunes. Below I’ve attempted to link directly to the artist pages where possible. Holiday wishes from (in no particular order) Saturn Darkhope, Oraia Sphinx, Scarlet at LPV, Gillian the Iron Powaqa, Rianna Stone the Pagan Homesteader, & Kathleen at Borealis Meditation. Comments: Comments Off on Podcast 22 – Yuletide Cheer! Today I thought I’d look at some of the holiday lore surrounding baking and cooking. What would the holidays be without the smells of cinnamon and nutmeg and clove and allspice slowly seeping out of the hot oven? And who imagines a holiday home without the presence of gingerbread or ginger cake of some kind? Chocolate and peppermint add extra luxury to an already indulgent season. In short, much of the magic of Christmastime and Yuletide seems to come from the kitchen (I’m sure many kitchen witches reading that chuckle in amusement that such sentiments even need to be typed out). Cinnamon – This handy kitchen spice has lots of magical uses. Cat Yronwode recommends it as a business drawing and gambling botanical. It can be used to make a wash-water which one would then use to scrub down the walkways in front of a business. This has the effect of drawing in new clients. In Jim Haskin’s Voodoo & Hoodoo, cinnamon is mixed with sugar and sprinkled in the shoes to increase gambling fortunes. Draja Mickaharic describes cinnamon as “calming” with a “protective vibration” and also cites its money-making properties in his Century of Spells (which refers not to a unit of time, but rather a unit of enumeration—a century representing the roughly 100 spells found in the book). Mickaharic also notes that “it has a claming and quieting effect on young children,” though I imagine in cookie form this may not be the case. Cloves – Mickaharic says these are “psychically protective,” and keep “negative thoughtforms out of the place where it is burned.” Presumably including cloves in any baked or cooked dish would involve at least heating them, thus releasing some of this power into the kitchen and home. Yronwode says that “cloves appear in spells for money-drawing, prosperity, room-renting, and friendship” (HHRM, p. 73). These are also used to make pomanders, clove-studded oranges rolled in orris root powder and hung as protective talismans in the home (well, protective talismans and lovely nosegays to help imbue the house with that sweet, spicy holiday scent). Nutmeg – This botanical has a mild narcotic effect and has been a staple of magic for some time. An old hoodoo charm found in Harry Hyatt’s work and later disseminated by other authors involves sealing a small amount of liquid mercury inside a drilled nutmeg, then carrying the charm around as a gambling mojo (this is NOT RECOMMENDED as mercury is highly poisonous—DO NOT DO IT!!!). Mickaharic describes nutmeg as an herb which inspires conviviality and jovial behavior, and promotes an air of happy friendship in the home. Allspice – “Good for social gatherings; increases the flow of conversation and the rapport between people” says Mickaharic (CoS, p.50). These hard, dried berries can also be soaked for a few hours, then strung as a type of herbal rosary using a needle and thread. Carrying this can help relieve stress and provide peace of mind. Yronwode recommends this for business and gambling (there’s a pattern here), and also describes a floor wash one can make with ground allspice. Mixed with cinnamon and burned as incense, Mickaharic says it “places a smooth and witty feeling” in the home. Ginger – This fiery herb is used to “heat up” or enhance the potency of various other magical ingredients, and also provides a little kick in spells for love or money (HHRM, p.103). The root can be used as a poppet due to its shape and sometimes-resemblance to a human body, and would be especially effective in a love or lust working. It can also be carried for protection. Sugar – Sweetening! This can be used to add a “sweet” or happy vibration to the home where it is burned (though it can smell very sharp when burned, too…baking it may not have the same oomph as burning it, but will smell better in the long run). Of course one can keep all of one’s visiting relatives’ name papers in the sugar jar in order to better provide a happy, congenial home during the holidays, but offering them lots of sugary sweets might help ply a good attitude out of them, too. As you can see, most of these herbs have to do with prosperity and getting along with one another (and a little protection thrown in for good measure). This makes sense during a season where money might be tight, tension runs high, and houses are full of dangerous things like fire and hot ovens. So when doing the holiday baking, it might be worth throwing an extra pinch or two of these spices in to up the magical ante of your confections. “The Baker’s Dozen” – A piece of reputed folklore recorded by Charles M. Skinner in 1896, this story revolves around a stingy baker and his encounters with an old crone who bewitches his bakery. Only through the magnanimous efforts of St. Nicolaus (and by swearing better behavior on a gingerbread cookie shaped like him) does he manage to break the spell. 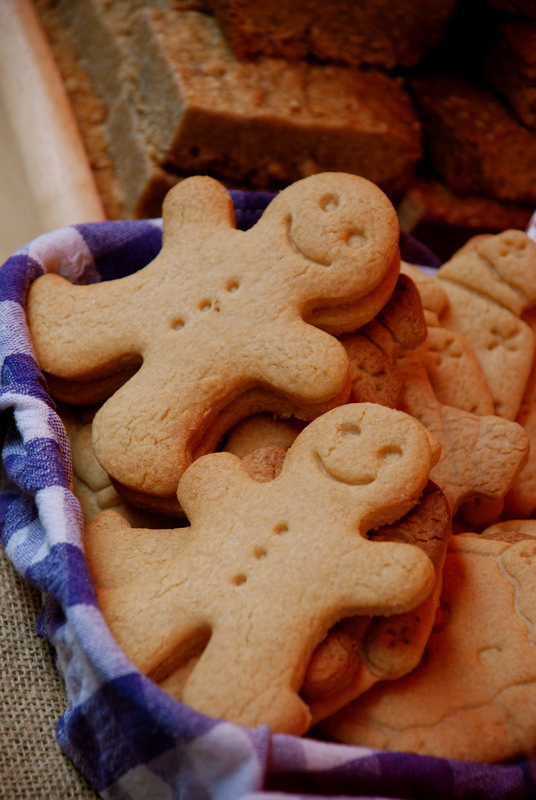 “The Gingerbread Man” – This famous story tells of a gingerbread man come to life who flees his baker and eludes capture by the people and animals of the village. He meets his match in the swift (and often crafty, in various retellings) fox, who finally devours him. Preheat oven to 350 degrees. Sift flour and mix in dry ingredients. Add egg, molasses, and shortening and mix. Slowly add hot water, mixing as you go. When dough is sticky, begin to work it into a ball. Dust a flat surface with flour and begin rolling out the dough, working it until you get it about ¼ inch thick. Cut out shapes with cookie cutters or a knife. Bake cookies on a lightly greased cookie sheet for about 15 minutes (or until they are crisp at the edges and fully cooked. Cool on a wire rack, decorate, and eat! 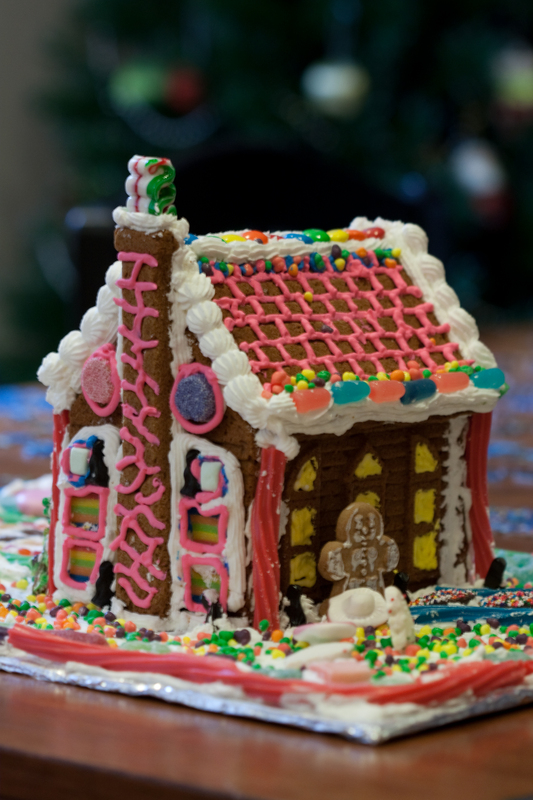 My mother and I used to bake several batches (rather, a whole day’s worth) of gingerbread, then spend time making the finished products into houses, sleighs, people, and animals. We gave them as gifts, decorated with royal icing and candy, and were often very popular around the holidays. I hope you enjoy! It’ll be like taking a little bite out of your New World Witchery host during the holiday season. Wait, that probably sounds kind of creepy. Enjoy anyway!